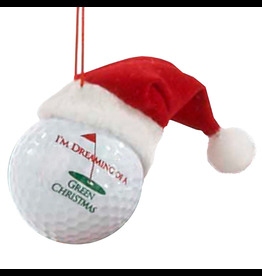 Golf Ball with Hat Ornament with I'm Dreaming of a Green Christmas. Size: 40mm. Christmas Ornaments and Decor by Kurt S. Adler featuring Golfers, Golfing and Golf Themed Ornaments. Golf Ball with Hat Ornament- Christmas Tees Me Off. Size: 40mm. Christmas Ornaments and Decor by Kurt S. Adler featuring Golfers, Golfing and Golf Themed Ornaments. Size: 40mm. Golf Ball with Hat Ornament- Holiday Hacker. Christmas Ornaments and Decor by Kurt S. Adler featuring Golfers, Golfing and Golf Themed Ornaments.